Sweet treats grown with just two ingredients! Most kids would rather help in the kitchen if the end result is something sweet. 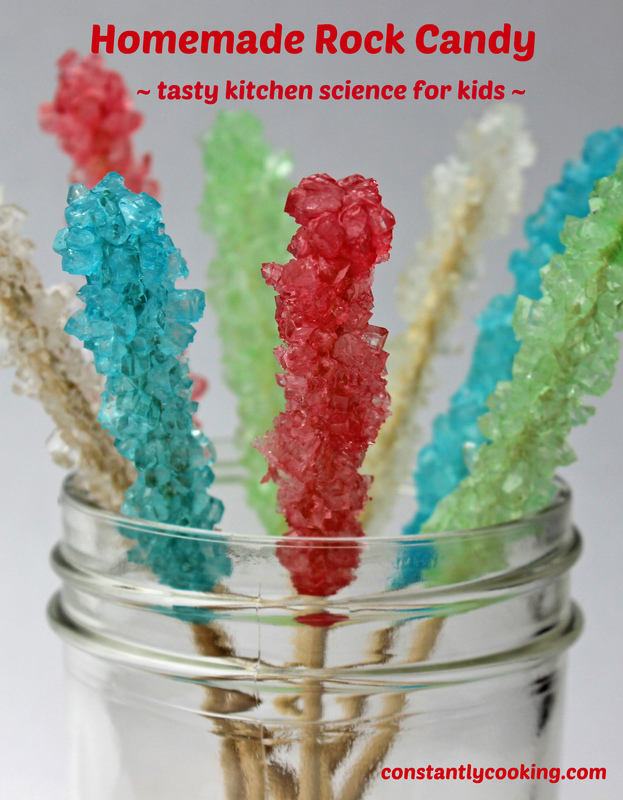 While my big kids now tend to prefer savoury treats, when they were little they adored our candy making experiments. This fun project takes a few days to complete but is a fascinating way to spark discussions about how science and food intersect in so many ways. 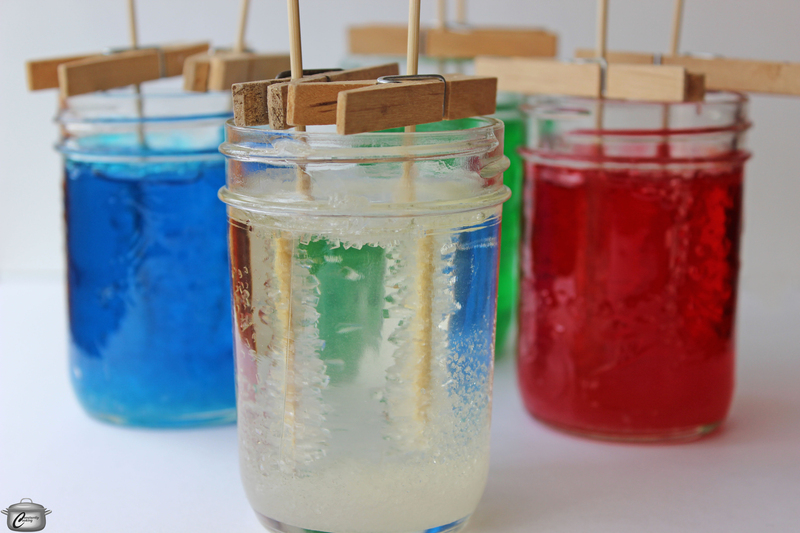 Kids (and grownups) will have a great time watching the crystals grow and, of course, sampling the finished product. It would be a great project for a school break or for homeschoolers. Kids can do most of this on their own but adults should help with creating the super hot sugar syrup and pouring it into the jars. 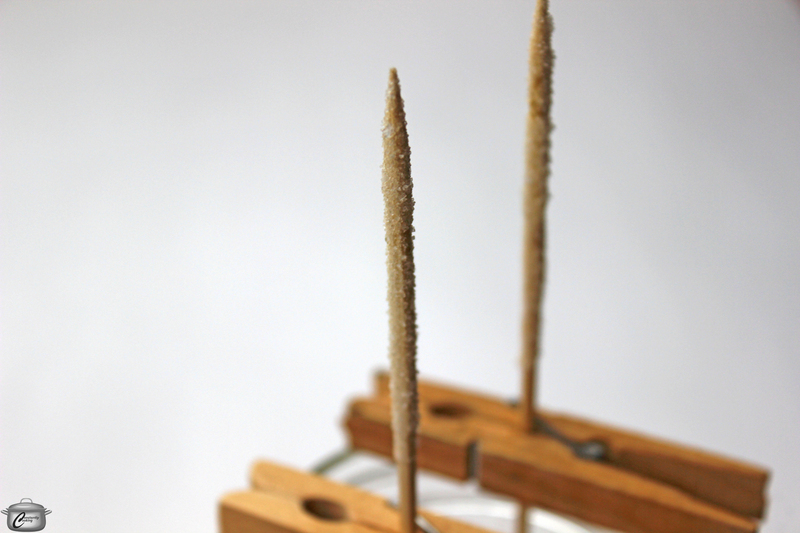 Clip wooden skewers into the clothes pegs and adjust as needed so that the pegs will rest across the top of the jars and a portion of the skewer will hang down inside. You can have two pegs / skewers per jar. You want the skewers to stay away from the sides of the jar and each other, and there should be about 1 inch of clearance between the skewer and the bottom of the jar. 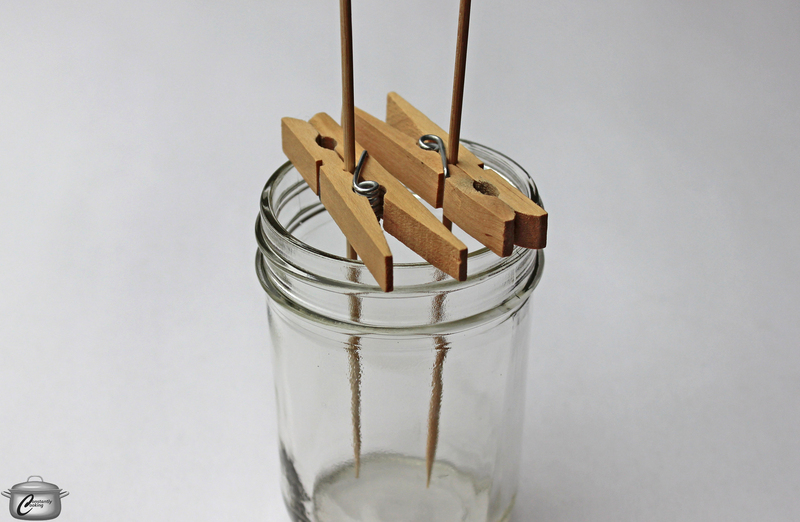 Remove the clothes pegs and skewers peg from the jars and set aside. Pour the water into a medium, heavy-duty pan and bring it to boil. Pour 1 cup of sugar into the boiling water, stirring until it dissolves. Keep adding sugar, 1/2 cup at a time, stirring after each addition until it dissolves. Stop adding sugar when no more will dissolve. This will take time and patience as it takes longer for the sugar to dissolve each time. Once no more sugar will dissolve, remove the pot from the heat and allow it to cool for at least 20 minutes. While the mixture is cooling, tilt the pot and dip the bottom portion of the skewers in the syrup then roll them in granulated sugar to put some ‘seeds’ on the sticks. This will help kick-start the sugar crystal growth. Invert the coated skewers on the jars to let them dry thoroughly while the syrup continues to cool. 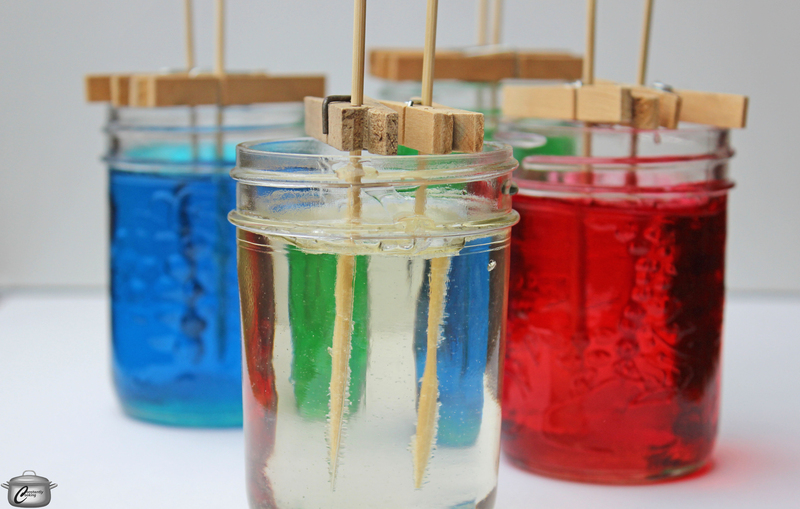 Remove the inverted skewers and add a generous amount of food colouring (10 drops for liquid colour) to the jars, leaving one natural for contrast, if desired. Stir gently to blend the food colouring. Pour the sugar solution into the jars, filling to within 1/2 inch of the top. 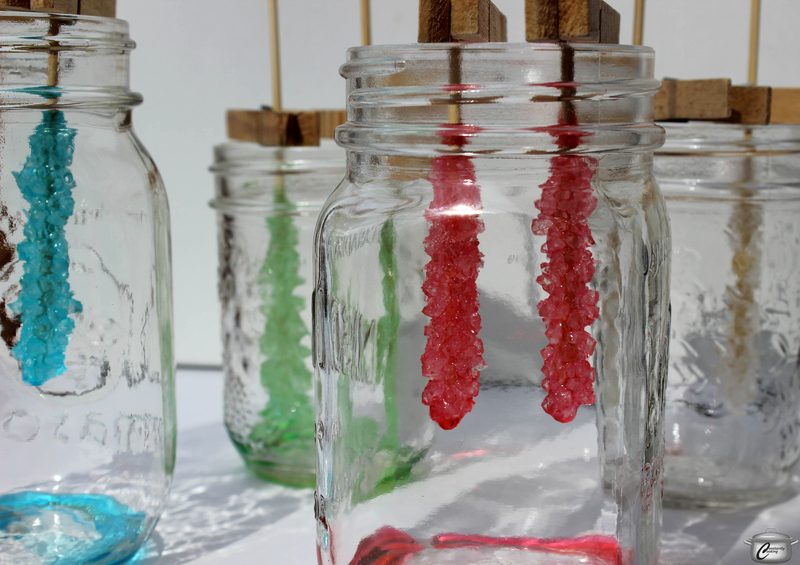 Carefully add two skewers, coated side down, to each jar, resting the clothes pegs across the mouth of the jars. Be sure they are hanging straight down the middle without touching the sides or each other. Put the jars in a safe place where they will not be disturbed but where you will be able to patiently watch the crystals grow over the next 7 days. Crystals will also form on the bottom, sides and even the surface of the jars; this is normal. 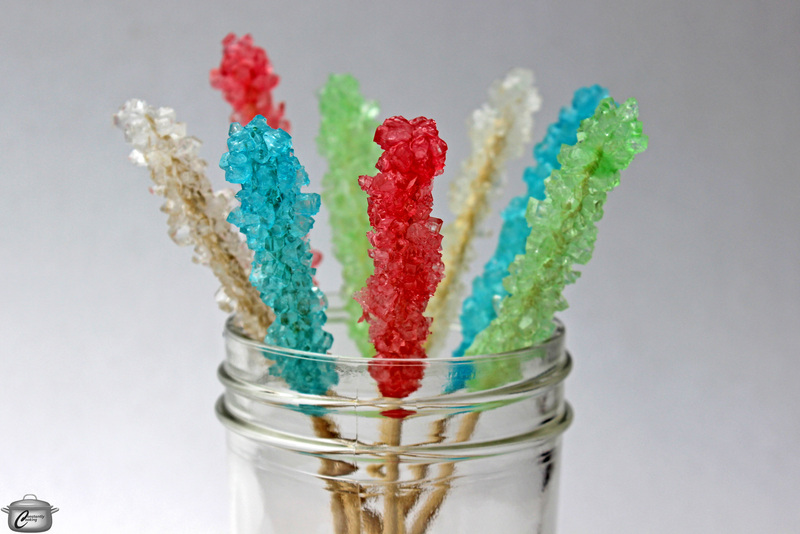 You will be able to easily shatter the solidified sugar layer on the top of the jar to extract the skewers when you are ready. After 5 – 7 days, remove the skewers and place them in clean jars to drip and dry for an hour or two, then enjoy! Any leftover candy can be covered with plastic wrap and stored. The solution you have made is a super-saturated solution, meaning the boiling water has absorbed more sugar than it would have absorbed at room temperature. As the solution cools, the water saturation point of the water will become lower, so the liquid will no longer be able to hold the amount of sugar. The dissolved sugar will be therefore be unable to stay in liquid form, and will instead crystalize on the skewer. If you have a magnifying glass or microscope, take a look at the crystals you’ve grown before you eat them! Note: this original recipe, created by Paula Roy, first appeared at YMC.ca. This entry was posted in candy, Edible Gifts and tagged candy, candy sticks, candy to make at home, Christmas, cooking with kids, crystal, edible gift, edible science, fun in the kitchen, gluten-free, gluten-free candy, homemade candy, homeschooling activities, kitchen science, March Break, nut free, nut-free candy, Paula Roy, rock candy, sugar crystals, sugar on a stick. Bookmark the permalink. This is clever as heck, Paula! Thanks. It really is a fun way to get little ones excited about science!